With our FEEL SAFE GOLD PACKAGE, you'll receive ID coded labels like that above. 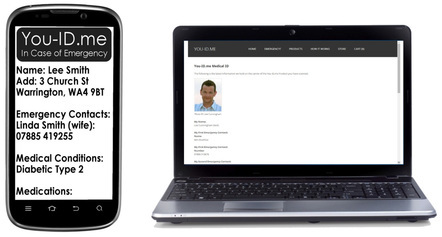 The code on your labels is totally unique to you - it links to your EXISTING You-iD.me Emergency/Medical Profile. Watch the short video below to see how this works. In an emergency it gives the Emergency Services fast access to high quality information about you. It provides them with all the information that you would want them to know. Pretend you are a paramedic for a moment! Use the code 4798a180215 in the emergency box below. NOTE: You'll need to use your browser's 'BACK' button to return to this page. Your unique ID code is a self-adhesive label designed to be stuck to the reverse of the ID card inside your wristband. In an emergency, Emergency Services can use the code on our secure website - accessible by Smartphone or PC. It means that Emergency Services get to know the important things about you fast. Our system works with all internet connected devices with a browser. The ID code on the labels that you'll received will be unique to you; just yours. Your emergency ID wristband becomes TWICE as effective when you stick your ID code to the reverse of your wristband's ID card. Your organ donation preference | Your religious beliefs etc. 2) Register and pay using promotional code "SAVE300"
Your wristband will become twice as effective. You will receive your You-iD.me Welcome Pack within a couple of days. When you register your unique ID Code get peace of mind. The total price of the above package is usually £150. If you have read this far then the chances are you agree its a great idea. 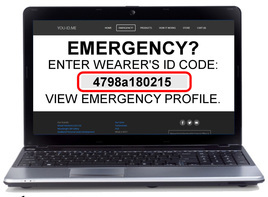 Join others who are making their Emergency ID Wristband TWICE as effective. ...but it can't stay at this price for ever! USE THE PROMOTIONAL CODE "SAVE120" TODAY & SAVE OVER £120 ON THIS TRULY AMAZING DEAL.